A great winter...says Meteorologist Brad Panovich. Perhaps the best winter in the last four years. Check out the video above! For the second year in a row, Wintergreen Resort was voted the “Best Ski Resort” by the readers of the WashingtonPost.com in the 5th Annual Readers’ Choice Awards. 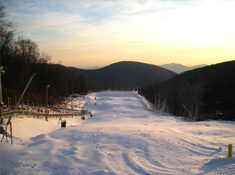 Wintergreen Ski Resort is located in the Blue Ridge Mountains, 43 miles southwest of Charlottesville, Va. Wintergreen Resort offers one of the more picturesque four season resorts anywhere in the eastern United States. They are renowned because, at certain times of the year, their elevation variance allows visitors to ski in the morning and play golf in the afternoon! Wintergreen is a family-oriented resort offering (23) trails and slopes with an excellent variety of beginner to expert terrain and a vertical drop of more than 1,000 feet! 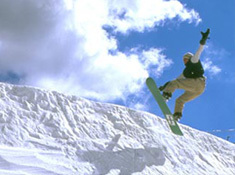 Wintergreen Resort features some of the best terrain around for skiing and snowboarding, and they offer a great terrain park and the largest snow tubing park in the state. The Plunge is a snow tubing park featuring eight lanes, 900-foot chutes and a 100-foot vertical drop. Wintergreen Resort also boasts 100% computerized snowmaking. They also feature two high-speed, six-passenger chairlifts that will get you back on the trails faster. 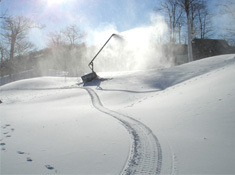 Wintergreen Resort has been a leader among Southeast’s resorts in snowmaking technology implementations. Like many of the ski resorts in the Southeast, Wintergreen has enhanced its York snowmaking system by adding 10 new guns to the advanced Highlands slopes, and two new guns to the new learning area. That adds to their 300 tower-mounted guns that are controlled by a computer system that makes continuous adjustments as temperature and humidity changes affect snowmaking over the entire mountain. For guests hoping to develop their free riding skills, this is their year to stick their tricks! Wintergreen is adding new beginner features and smaller tabletops to its terrain park. To make sure guests spend their time on the slopes and not in line, Wintergreen has invested in rental shop improvements and new HEAD rental equipment this season. 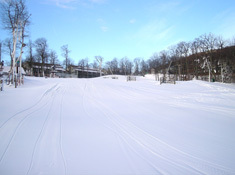 Wintergreen Resort offers more than 275 rental homes and condominiums ranging in size and amenities. They also offer a spa and fitness center, six great restaurants and a wide variety of shopping choices.